This week I'm so excited to be joining the Dolce Vita Blogger link up, hosted by Kelly from italianatheart.com, Jasmine from questadolcevita.com and Kristie from mammaprada.com. One of my favorite things about starting my blog last year was the community that I suddenly got thrown into. Many of us aren't full-time bloggers or getting paid to write, but are genuinely in love with Italy and want to share that excitement. This monthly blog topic is a great way to share everyone's stories in one place and find something new to read if you love all things Italia as much as I do. The topic of December is, Italian connections: how are you connected to Italy? and I can't wait to see what everyone else chooses to write about because I was a little torn... My Italian connection is at the most a tenuous one and unlikely at that. Keep reading to see how I ended up living in this country, with no Italian family, background or connections to speak of. At first glance, I don’t have much of a connection to Italy. My ethnicity is a decidedly uninteresting mix of many nationalities and backgrounds making me resoundingly American. I don’t have a big Italian family or a history of Sunday lunches and before 2 years ago, the extent of my Italian language skills was “ciao”. But somehow here I am, two years into my Italian life and feeling more at home in this country than I ever felt in the US or at college. My story of how I got here isn’t anything exceptional but a collection of happenstance decisions that led me to completely reinvent my life. My story starts with the curse of laziness. I was 17, I’d been studying Spanish my whole life at in public school and still couldn’t manage to put a string of words together. I was entering college and as a part of my liberal arts and crafts science degree, I had to take two years of a foreign language. The Spanish class would’ve involved me taking a placement exam and so I made the mature decision to switch languages to Italian. As always, I struggled though my language classes and never put any more time than necessary into them. While I was focusing on figuring out my major, career path and which sorority would accept me, Italian feel HARD by the wayside. The one thing I was sure of, however, was that I wanted to do a study abroad semester while I was in school. It was something I asked about on college tours and my school (Villanova University) had a particularly interesting and extensive program. My only decision was where. I didn’t feel any connection to the places I could choose from based on my major (Communications) and eventually had to choose one at random. While I don’t remember my list of choices, the one I finally went with and the decision that had such an impact on my entire life was in the end, of course, Rome. Flash forward a couple of semesters and months later, I was loving life as an American study abroad student. I still wasn’t focusing on my language skills at all but I had discovered the joys of supplì, pizza that cost €5 and legal drinking. Rome was great but it would never be a place I could see myself long term. Luckily for me, a turning point in this study abroad experience came through one of my best friends that I made on that trip, as she was doing a school project at my house. Out of her class of mixed Italians and Americans at Università Roma Tre, one of her classmates was doing the project with her and asked us if she could invite one of her (cute) (single) friends over. This Italian guy came over, offered his advice on their economics projects and then started drinking with us. We all ended up going out in Trastevere at the bad American bars and had a good time together. He found me on Facebook the next day *modern romance* and promptly asked me out on a date to get burgers, while I shockingly was expected something more in the line of Italian food. As we got to know each other, I got over my fear he would kidnap me, realized we liked the same American tv shows and both saw the world similarly. He was open to travel, different cultures, trying new things and was so completely different from anyone else I had ever met in my life. It didn’t take me long to fall in love, but it took me much longer to admit it. Of course, I had to go home after 2 months of dating this guy and I was convinced we would break it off. I couldn’t see myself handling a long-distance relationship well and thought that I would never be willing to leave home and my life for another person. But over the course of my remaining 2.5 years at school, he came to visit me 3 times and I went overseas 3 times. We knew that we would make our relationship work, whatever it took, so eventually, I moved over to Italy after graduating. I lived with his family for 6 months, becoming more “Italian” than I could’ve ever hoped. His mom taught me how to cook (somewhat), I was forced to finally learn a basic, then competent, level of Italian for the first time and I showed myself that I had what it took to not only live in a different country, work in a different language and be away from home for months on end, but that my relationship could get through whatever it took, thick or thin. Flashfoward to the present day and I'm now living with the same guy I met 4 years ago on my study abroad trip. We're making plans for our future together and I honestly couldn't be happier. So, to sum up this rather long story, I’d have to say that my most basic, strongest connection to Italy is my gorgeous, determined, burger-loving boyfriend, Edoardo. He has given me everything I could hope for from a relationship but has also opened up my world to the joys of living in Rome. This city, country, and boy have my heart and I can’t imagine my life without them. This was taken 2 years later, after I moved back to Italy permanently. .
All of my Italian experience is due to this good looking guy here. Well there it is! This story is something I always whip out when people ask the innocent question of, “How did you guys meet?” but I haven’t shared it on the blog before. If you haven’t already, head over to this link to read more about other bloggers' connections to Italy. There are so many people that call this country home and their stories are fascinating! 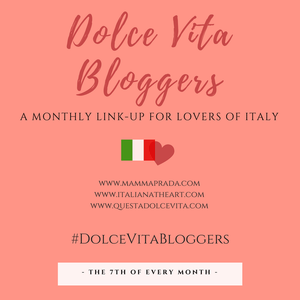 I absolutely love the idea of doing these monthly themed posts and I can’t wait to see what topics the dolce vita bloggers team has in store for 2018.